This is a specially designed, super-soft cloth that's made for cleaning dust and grime off of your camera and lens. The microfiber helps to prevent scratching from occurring. Using any other kind of material, like a wash cloth, paper towel, or tissue paper, would most likely result in minor scratches. This cloth can be used on the camera body and screen, as well as the lens. If it ever gets too dirty, you can wash it over and over without ruining it. These little things are great for getting dust and hair off of your lens without any risk of scratching it. Just squeeze the bulb and you get a blast of air that will clear off most of the dust particles on your lens. You can also use it to clean the sensor. If you notice that there are little black spots in your photos, try taking off your lens, setting the camera on manual, setting a long shutter speed, and blowing some air into the camera after you press the shutter button. This should remove any spots from your sensor. Be sure to hold your camera down when doing this so that the dust falls out of the camera and not farther in. These are the little packets that you often find in shoe boxes. Their purpose is to absorb moisture and prevent mold from forming. These packets can also work in your camera bag. Just throw a few in there, and if your camera gets a little damp, the silica will absorb the moisture and prevent your lens from becoming filled with mildew. This is perhaps one of the best and cheapest investments you can make. My first camera did not have one of these and even though I was careful to protect the screen for 3 years without any harm, it only took one time to accidentally leave a permanent scratch on it. Screen protectors and cheap. LCD screens are not. And if you happen to scratch the crap out of your protector, you can always buy a new one for very little. 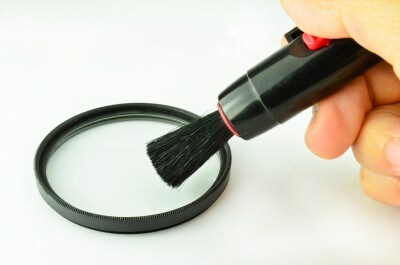 A lens pen typically includes two cleaning tools: a small brush and a soft pad. The brush is great for gently removing dirt and dust particles on the surface of your lens, particularly around the seal and edges. The pad contains a cleaning agent which can be used to remove smudges and fingerprints from the lens without damaging the coatings on the surface. Lens caps are important for protecting your glass, but their downfall is that they're so very easy to lose. Multiple solutions have been invented to avoid this, such as the lens cap string that tethers your cap to your camera, and even a camera strap that has a spot to snap your cap into. But ultimately, these things are either annoying or they don't work. Regardless if you have one of these cap saving gadgets or not, it's always best in invest in a few extra because when you lose yours, you're out of luck until you get a new one. This may sound obvious, but a bag is good overall protection for your camera. Don't think that it's just for outside use though. When you need to store your camera at home, a small camera bag is great because it keeps it out of the potential humidity and prevents it from collecting dust. Most cameras are like cats in that they don't like getting wet. Cameras that are not waterproof or water resistant will not tolerate the rain very well. While you can always throw your camera in your bag, it doesn't do much good if your bag gets wet because then your camera is stored in a very humid area. Having some kind of rain gear is a smart idea, especially if you do a lot of outdoor shooting. Many bags come with built-in rain gear. If yours doesn't, a trash bag, or even a large freezer bag, will work as a temporary solution for keeping your gear dry.